Professional funeral services in the Wigan areas – To discuss any funeral plans please don’t hesitate to contact us today. Alan Jones are an independent, family-run funeral directors, operating four funeral homes (in Ashton-in-Makerfield, Hindley, Haydock and Golborne) throughout the Wigan Borough. Alan Jones Funeral Directors offer clients flexibility since establishing in 1989, we have been committed to providing a compassionate, caring service for all our clients. It is our aim to make the process of arranging a funeral as simple as possible, keeping any stress to a minimum at this difficult time. We pride ourselves in offering a truly bespoke service. Our thoughtful, understanding team will be on hand to guide you through each stage and help you plan the funeral in every detail. 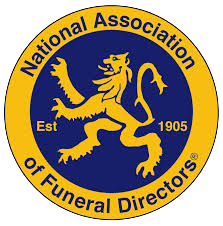 We are pleased to say that our funeral directors and embalmers hold diplomas from the National Association of Funeral Directors (NAFD), British Institute of Funeral Directors (BIFD) and the British Institute of Embalmers, ensuring best practice is upheld. If you have any enquiries about the services we offer, please contact us.